Home » Spread the word! What if your government said your vote didn’t matter? Sounds like it must be happening somewhere else, right? In fact, it’s happening right here at home: in the heart of Canada’s prairies, to the people who produce the wheat, durum and barley that is treasured in Canada and around the world. In early September, 2011, 40,000 farmers voted in the Canadian Wheat Board (CWB) plebiscite on the future of the CWB. 62% of wheat growers supported the single-desk CWB and 51% of barley growers supported the single-desk CWB. The federal agriculture minister Gerry Ritz told them that their vote doesn’t count. Farmers voted to keep the CWB marketing system because it puts more money in their pockets, protects farmers from the power of transnational grain companies, and keeps control of our grain marketing system where it belongs – in the hands of Canadian farmers. 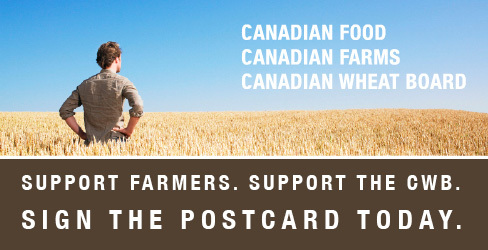 Take action today – write to Prime Minister Stephen Harper, Minister of Agriculture Gerry Ritz and your MP.